After forming a double bottom, MMS Ventures is trying to climb back up to form a new daily uptrend. Let us see if MMSV is able to grind higher and break the old highs. The chart below is the daily chart of MMS Ventures. The stock had a really nice uptrend back in 2017 and this provided a great return for investors. Traders also had ample opportunities to do swing trades. Which is why the easiest time to make money in stocks is when it is in a strong uptrend. You would do very well to focus on these kind of stocks. MMSV had a correction which ended with a double bottom. It broke above a downtrendline and shot higher only to correct again. There is a reason for this. If you look at the chart carefully. you will notice a huge area of resistance which I have circled. This kind of resistance is not easy to overcome and therefore it will take some time for MMSV to overcome it. It kinds of remind me of the consolidation resistance that is present in Hengyuan at RM 17. To overcome the resistance, I would prefer to see a consolidation box and a breakout above it. That way, the supply (people who lost money) will be fully absorbed. Short term traders should look at the top of the double bottom as well as the downtrend line. If MMSV can stay above here, then short term wise it will be alright. MMSV will just trade sideways and hopefully it will form a consolidation box for us to buy a breakout play. The other thing that is beneficial to MMSV is the rising 200 MA. Normally this points to the long term health of a stock. As long as MMSV is able to stay above the rising 200 MA, then we can consider any movement to be a correction rather than the beginning of a crash. Let us now look at the long term picture of MMS Ventures. For that we will whip out the weekly chart and study it. As you can see, MMSV's share price broke out of a long term downtrend line and this set the stage for a massive bull run in the stock. After such a nice big bull run, it is not surprising to find MMSV trading sideways. It is normal and it is healthy. But you have to make sure it stays within the trading range I have drawn. If it can stay above the lows of the box, then anything that happens in between is just a pause that refreshes before MMSV breaks higher. Looking at the weekly chart, I prefer more sideways trading before breaking out rather than a quick fast rise up. That's because we might see a double top if that happens. 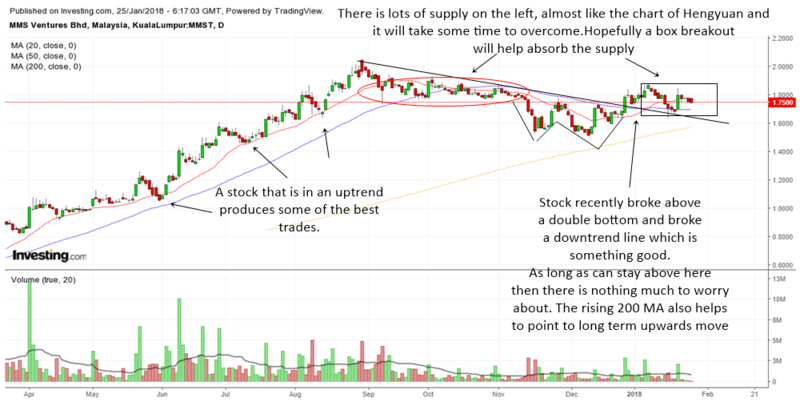 A slow consolidation and then a breakout above a weekly consolidation box would be ideal to send the stock higher in the long term. MMS Ventures was a very hot stock back in 2017 until it had a nasty correction. In this analysis of MMS Ventures, I will put the daily chart and the weekly chart side by side for comparison. The daily chart will be on the left and the weekly chart will be on the right. The recent rise in the daily chart happened because of the oversold stochastics in the weekly charts. This provided a catalyst for the stock to be traded in the daily time frame. In the daily time frame, the stock formed a bullish divergence double bottom. Some may see an ascending triangle forming as the stock bottomed in the daily chart. 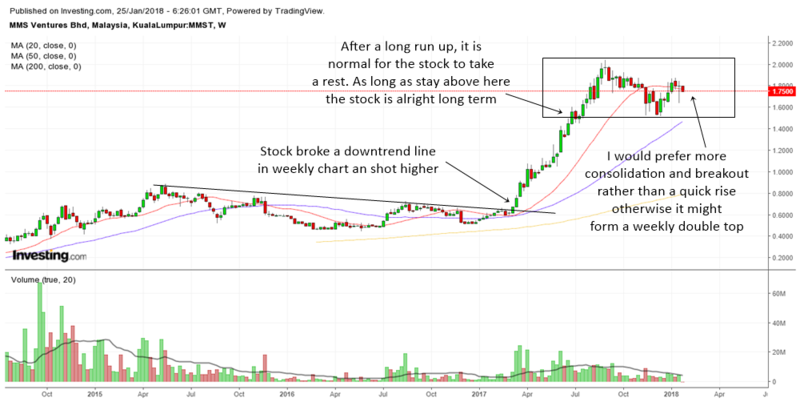 Usually stocks that have this bottom can shoot up high quite fast but the slow grinding up in MMS Ventures is because of the stubborn resistance which you can see in the daily chart. That will take some time to be absorbed. Anyway, I will stay bullish on this stock if it can manage to stay above 1.70 area. Which is just slightly below the top of the daily ascending triangle. Furthermore, the weekly chart is probably forming a bullish MACD buy signal, so if MMSV can stay above 1.70 then we should be bullish bias.